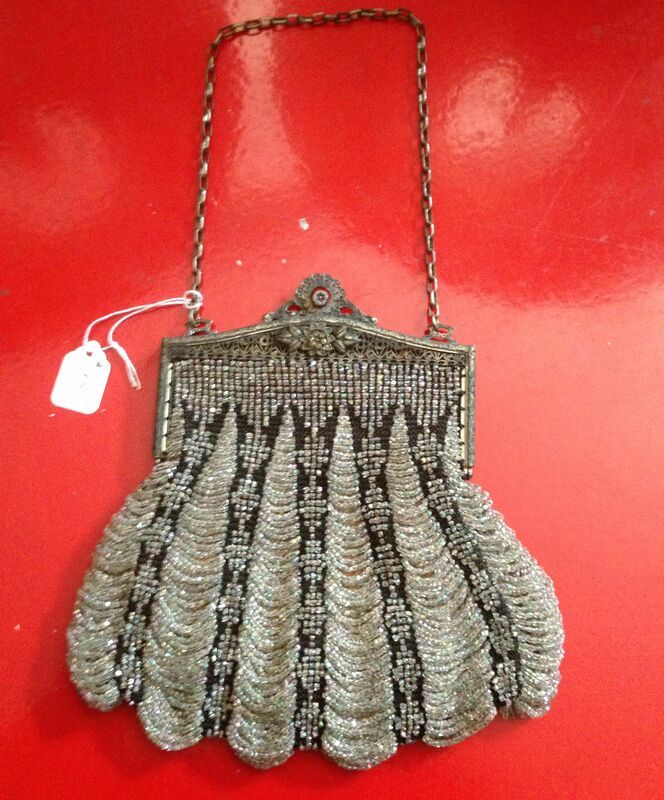 I'm not sure what got into me, but suddenly I'm selling my vintage evening bag collection that was fifty years in the making. This rare, beautifully made alligator-embossed leather bag by Glen Miller/Ann Turk of Miami dates from the 80s, when Ann Turk bags sold for $600-700 at Saks. I remember the first bag so vividly: It was a small puffy little satin roly poly on a chain with tiny seed pearls and a compact with a powder puff in the clasp. It cost $1. I swear I was craving thrift shop treasures even before Barbara Streisand notoriously gave it an aura of chic. 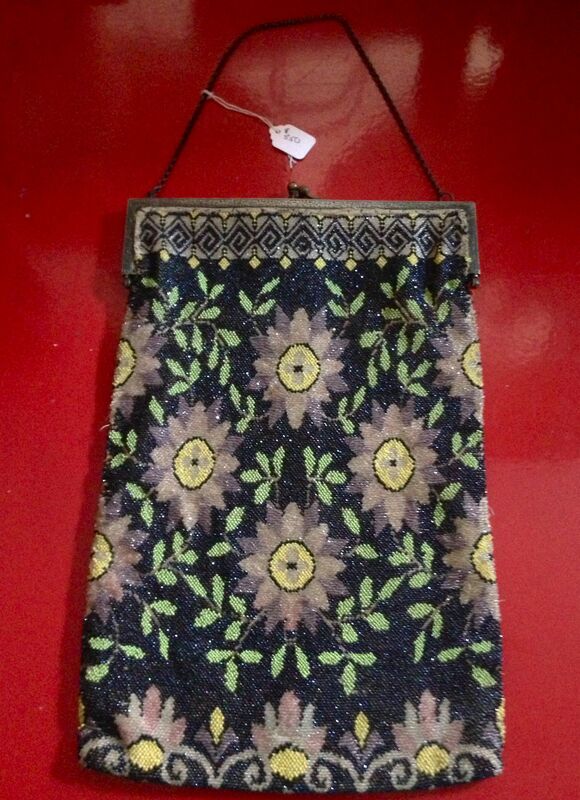 This stunning purse features a silver beaded background and intricate ropes of flowers. The fringe is almost totally intact, with some wear on one side. At some point I discovered Sylvia Pines' Uniquities, a small shop at 1102 Lexington. Sylvia told me she'd been forced to open the shop when her own collection grew out of control. I quickly became addicted. When a boyfriend asked what I'd like for my birthday, I gave him the shop's address. 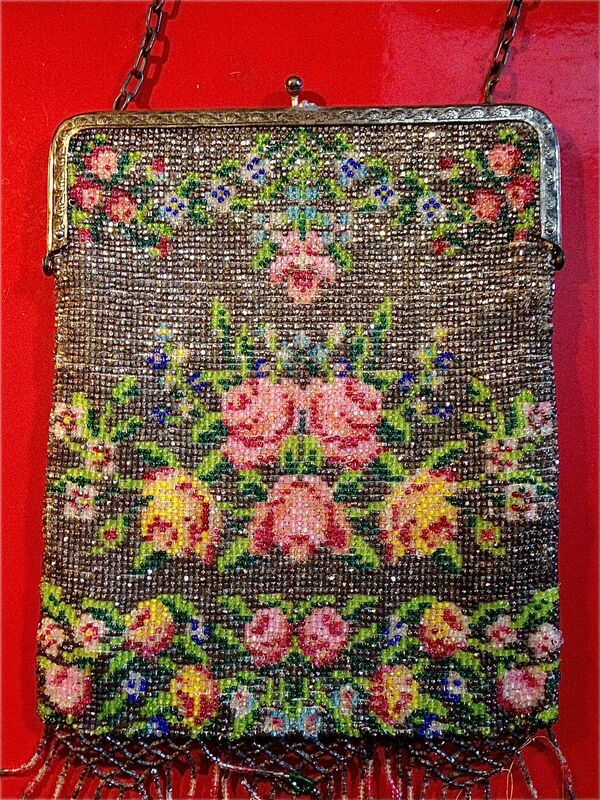 I hate to give up this long rectangular bag with pink beaded flowers. It's big and roomy and ideal for wearing right now -- if you're willing to leave your heavy iPhone at home. One day after lunch at LeCirque, the fabulous Patrick Shields wanted to buy me a Christmas gift. We went together and I picked out a wonderful black suede art deco pouch with a marcasite watch in the frame that worked. It was outrageously expensive. He flinched but recovered and bought it. He asked me to help him choose something for Elaine. I spotted an exquisite all over beaded rectangle with a red snake on it. I wanted it too. But I wanted the art deco suede more. The unusual snake went to Elaine. This wonderful little roly-poly covered in red, blue, green and bronze bugle beads is perfect -- like new. I can't guess the date because I've never seen another like it. I once asked her, years after Patrick's too early death, if she still had the beaded snake bag. "Yes," she said. "I love it." I meant to check out her estate sale to see if it was there. 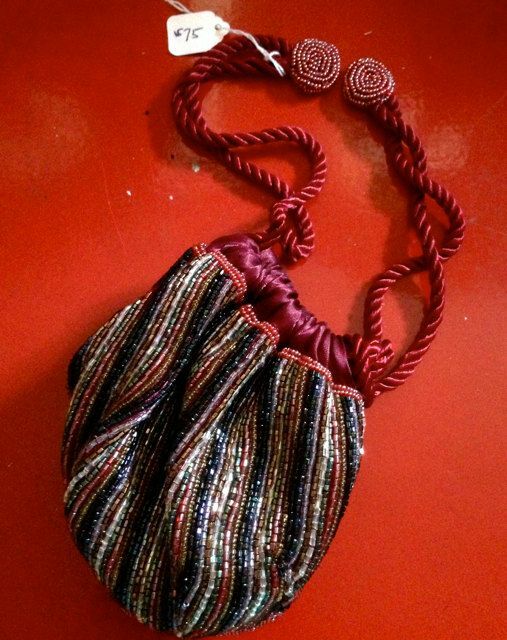 Iridescent beads are sewn on to black bouffant poofs on the front and back body of this French style evening bag. But now I am deaccessioning. My assistants and I posted the bags on Etsy a few weeks ago and three sold in a few minutes, probably seriously underpriced, I guess. We've added 15 more gorgeous bags since then. 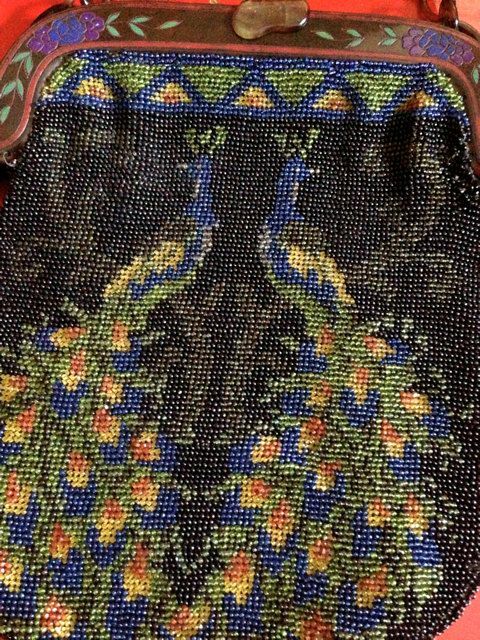 This beaded bag in royal colors with peacock strut has flowers etched into what looks like a tortoise shell and bakelite frame. $245. Click here to see what we've posted so far. If you're a collector and want to visit my office to see more, email me. Today's royal blue and purple are Elizabethan colors perfect for vintage bags.